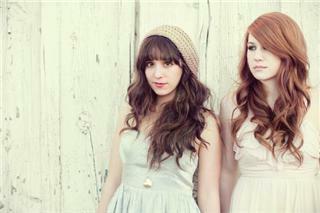 Beautiful sister duo POEMA released their full-length debut, Remembering You, on September 11, 2012. Creating their own songs and their own sounds, Shealeen and Elle have fully embraced their musical heritage and yet simultaneously forged new paths with the music they are making. Not just another duo, these two sisters from Albuquerque, NM, grew up in a close-knit family where music was an integral part of their life. We are always growing lyrically and musically, says Elle, and were comfortable in that. This album focuses on relationships- the building, the tearing down, the earthly and the heavenly. As they have lived, they have written and sang and poured many of their own stories into this new album. These sisters are unique in a lot of ways- very different from each other, but the best of friends. Their relationship is deep and profound, not only when they speak, but all throughout the music, their bond can be heard and felt. Whether it is in the rolling harmonies or the heart-felt lyrics, the relational theme plays itself out in quietly powerful ways. POEMA was named as one of APs Top 100 Bands You Need to Know, and after years of making music together, touring, and putting out successful EPs, the girls are excited about releasing their first full-length album. In the past few years, the girls say, they have fallen in love all over again with country music- the new and the old- and that grassroots sound bleeds throughout the album. Its the story-telling, Shealeen says, it draws you in. We write like that and connect with those types of songs. Inspired by the likes of Patsy Cline and Nickel Creek to John Mayer and Loretta Lynn, their love for country, with a touch of acoustic pop and folk, can be felt from the first spin. Whether heard as singles or one full piece, this album reminds of the simpler times, family, and the varied emotions connected with being human.